I am a fairly even and projected breast shape. I have average-to-narrow roots with a slight omega shape. My best fitting bra is a Cleo Lily in 30G. 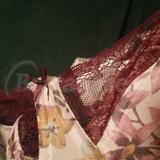 This bra fits somewhat similarly to the Lily, although it has a more closed top and slightly wider wires. I find the shape to be a little pointier, though still quite flattering (as someone who prefers a rounded shape). I suspect this is due to the two vertical seams creating a slightly different fit. The floral design is classy and pleasant to the eye. It's fairly modest in colouration, with many purple-ish fall tones. The lace on top adds a little interest to the design overall. The band is snug and fits comfortably. On May 2014 It fit her!